President Trump blasted NFL players who took a knee in protest during preseason games, saying that players who fail to stand during the national anthem should be "suspended without pay." The president's latest broadside against NFL players who kneel during the national anthem came in a tweet Friday morning in response to Thursday night's games. "The NFL players are at it again - taking a knee when they should be standing proudly for the National Anthem. Numerous players, from different teams, wanted to show their "outrage" at something that most of them are unable to define. They make a fortune doing what they love...........," Trump stated. He continued that players should "Be happy, be cool! A football game, that fans are paying soooo much money to watch and enjoy, is no place to protest. Most of that money goes to the players anyway. Find another way to protest. Stand proudly for your National Anthem or be Suspended Without Pay!" A new NFL policy announced earlier this year by league Commissioner Roger Goodell requires players to stand during the national anthem but gives them on an option of remaining in the locker room during the pregame performance of the song if they choose. The NFL policy says a club will be fined if team members on the field during the anthem do not stand, and that the commissioner "will impose appropriate discipline on league personnel who do not stand and show respect for the flag and the anthem. 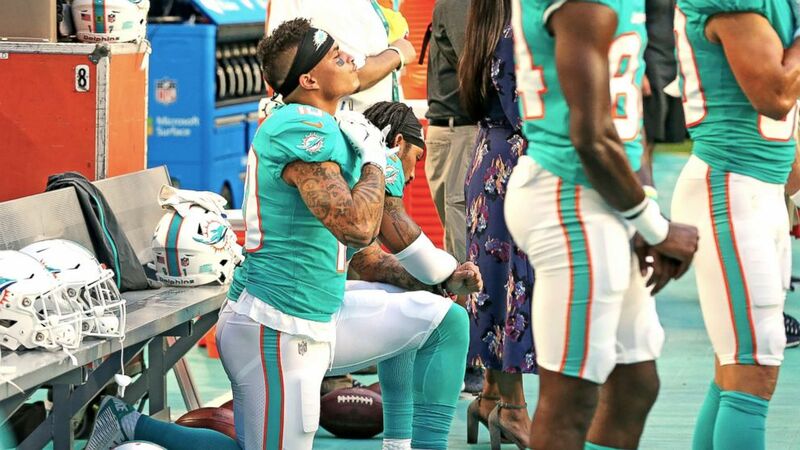 During Thursday's games, however, a few NFL players knelt during the anthem. Others raised their fists during the song or remained in the locker room. The NFL said in a statement Friday that it has agreed with the NFL Players Association to delay implementing work rules that could result in players being disciplined while discussions between the league and the union on issues around the anthem continue. "The NFL has been engaged in constructive discussions with the NFL Players Association regarding the anthem and issues of equality and social justice that are of concern to many Americans," the statement said. "While those discussions continue, the NFL has agreed to delay implementing or enforcing any club work rules that could result in players being disciplined for their conduct during the performance of the anthem. "Meanwhile, there has been no change in the NFL's policy regarding the national anthem. The anthem will continue to be played before every game, and all player and non-player personnel on the field at that time are expected to stand during the presentation of the flag and performance of the anthem. Personnel who do not wish to do so can choose to remain in the locker room." After the NFL first announced the new policy in May, Trump told Fox & Friends that players who don't stand during the anthem "shouldn't be playing" and maybe "shouldn't be in the country." ABC News' Aaron Katersky contributed to this story.